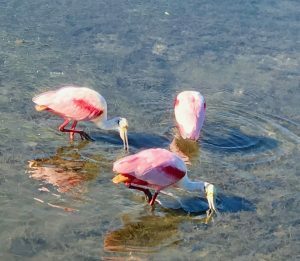 Wall Springs Park is located right on the shore of the Gulf of Mexico in beautiful Palm Harbor Florida. Wall Springs Park is a natural spring that was once a bathing and spa area for wealthy northerners. Charles Wall purchased the property in 1884 and it was used as a spa retreat until the 1960’s. Pinellas County began purchasing the property with the goal of making a large park and today the park comprises 210 acres. Wall Springs Park, located between Crystal Beach and Tarpon Springs, is a favorite destination of locals. Accessible from the Pinellas Trail as well as by car, this great county park offers five picnic and grill shelters that can be reserved for parties. In addition to the shelters, there are restroom facilities, wonderful nature trails, boardwalks, an observation tower, fishing piers, playground, butterfly garden and a historical area explaining about the history of the park. If you are planning on fishing in the park, remember that here in Florida you must have a fishing license, even if fishing from shore. The spring in the center of the park comes from the Upper Florida Aquifer. The average water flow from the spring is 2,917 gallons of water per minute and the spring’s temperature is a pretty constant 74 degrees. Swimming is no longer allowed in the spring and neither is fishing. Here you can see not only some of the largest mullet you will ever encounter, but also snook, redfish, sheephead, needlefish, white bait and of course otter and a wide variety of tropical birds. The fish seem to know that as long as they are in the main spring area, they are safe from fishermen. Naturally, since the spring and Boggy Bayou are connected you have a great chance of catching plenty of fish from the park’s fishing docks that are on Boggy Bayou. We are indeed lucky to have Wall Springs Park here in Palm Harbor Florida. It is a popular family destination for all who live in the area. John Chesnut Park is located on the eastern shore of Lake Tarpon in beautiful Palm Harbor Florida. This 255 acre waterfront park was built in cooperation with the US Army Corps of Engineers. Home to three fantastic nature trails, playgrounds, picnic areas, picnic shelters, restroom facilities, a horse shoe pit, fenced in doggie park and a public boat ramp with access to Lake Tarpon, this is one park you don’t want to miss! Lake Tarpon is five miles long and over a mile wide. It is home to large bass as well as our Florida gator. Fishermen love fishing this lake but remember that you do need a Florida fishing license to fish from shore or boat. The park is also home to deer, raccoon, hawks, osprey and many other creatures. With miles of boardwalk along the shores of the lake and through the swamp areas that connect to other hiking trails, this park offers enjoyment for the entire family. Just remember to bring your camera so you can capture memories you will never forget! John Chesnut Park is one of several magnificent local parks here in Pinellas County Florida. Type of Waterfront Property: The term ‘waterfront’ can mean anything here from direct ocean access and view to being on a salt water canal with direct ocean access, salt water canal with fixed bridges, canals with no ocean access, fresh water canals and lakes, ponds and even retention ponds. ALL of these are ‘waterfront’ classifications! Sea Walls: If you are purchasing waterfront property and there is a seawall, you need to have a seawall inspection completed by a seawall specialist or a structural engineer. The inspection will cover the condition of the actual seawall as well as any cracks or structural issues in the area of the dock. Boat Docks: The dock also needs to be inspected prior to purchase. What condition is the dock in? If you are intending on adding a dock, be sure to contact the local government office responsible for permits to make sure that you will be allowed to add that dock after purchase. Lifts and Davits: Unless your boat is so large that it must be in the water at all times, most boat owners will choose to keep their vessel out of the water. Inspecting the davits is always recommended! Not all canals are equal! Often homes located at the end of a salt water canal farthest from the open sea will find that there are times they cannot put their boat into the water due to low tides. If you think this may be an issue, check the depth of the water behind your prospective property during low tide prior to purchasing. These are all items that you need to be aware of if you are considering purchasing waterfront property. The Palm Harbor Florida area has numerous waterfront homes currently on the market. Contact me for a list of homes available and let’s begin your search! 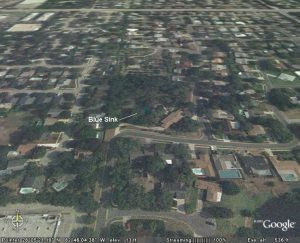 Blue Sink of Palm Harbor Florida was once a popular swimming hole. Those who grew up here remember being able to go swimming in Blue Sink back in the 1950’s, 60’s and 70’s. The sink hole is 190′ deep and the kids used to swim and dive down there. The majestic live oak trees at the water’s edge provided a place to hang a swing and the limbs were great diving platforms! Back then, the area was surrounded by orange groves and the kids got there via their bikes. With a shot gun slung over his shoulder, my partner Ron used to go there with his buddies to cool off after an afternoon of target practice once they got out of elementary and middle school. That was in the 50’s and 60’s, when nobody thought anything about a kid on a bike with a shotgun over his shoulder. They were boys just being boys. During the 1980’s the property was developed, homes were built (the Hidden Lake Community was established) and the property around Blue Sink was purchased. This property consisted of just under three acres of land with the fabulous Blue Sink in the middle. A three bedroom two bath home was built, fences put up and that was the end of the kids being able to swim in the sink hole. While the Hidden Lake Community of Palm Harbor Florida does have a great public park on a large lake complete with tennis courts and playground, it would have been great if the developers had included this land into the public park area. Perhaps one day the land will be returned to the public. In the meantime, the only views to the public are aerial and the only swimming done in Blue Sink is done by the Koi Fish that call it home.